Enjoy your favorite meal out in your own private space. The pool at night. your apartment is the ground floor of the building in the photo. Looking from your apartment over the pool to the rear building. BBQ by the pool. Enough closet space for two, sliding door access to pool area from bedroom. Kitchen equiped with all the ameneties if you choose to eat in. Clean and fresh linens. Ceiling fan and air conditioner for a well rested night. Flat screen t.v. and some hand picked books for you to choose from. Open living / kitchen space, dinner table, sofabed and sliding door looking out to the pool area. Glass doors open onto your personal garden patio. The perfect place to enjoy your morning coffee and meals. 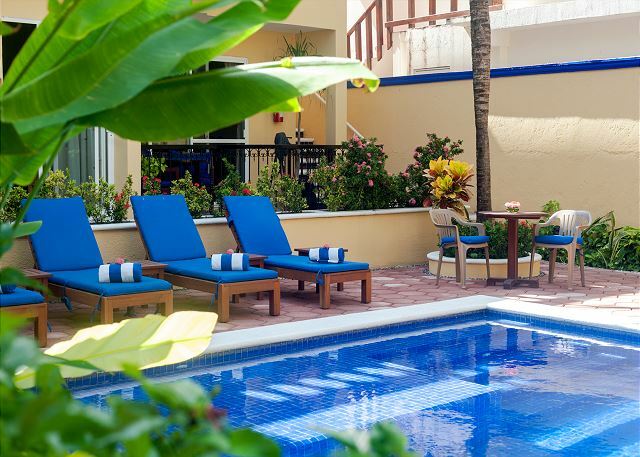 Your view is of the sparkling blue pool and lush garden. This ground floor apartment is spacious, comfortable and well maintained. New king bed with foam top covered with 500 thread count sheets. Well equipped kitchen. Free Wi-Fi, bikes, flat screen TV. Linens supplied. Central office onsite with friendly English-speaking staff to help you with anything you need. Yoga classes on the building's shaded roof in the winter season. Abbey del Sol was rented for me, sight, unseen. What a nice surprise! The apartment was spacious and, most important for me, quiet. The grounds & pool are lovely, safely tucked behind a gated wall yet a few short blocks walk to the Plaza's shops & many restaurants. My high praise goes to the staff who were all friendly, helpful. The best thing I can say is that I'd stay again. Thank you for Claire for your feedback, we are happy to know you enjoyed your stay with us, we hope to see you again! Lovely unit, great staff, clean pool, friendly neighbors. Karen and Cameron it was a pleasure having your stay with us! Thank you for your kind words. See you next year. I can't say enough good things about this place. 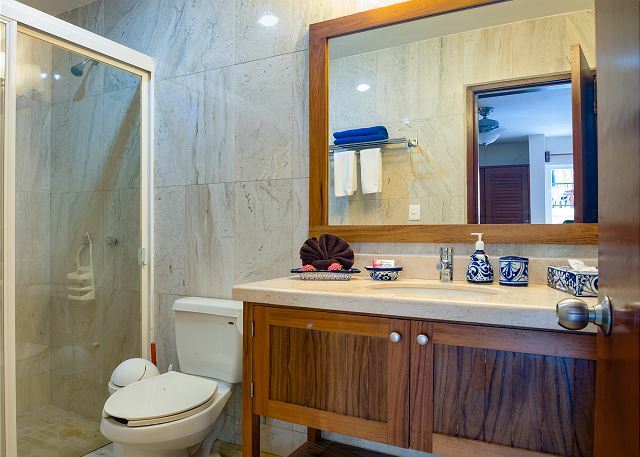 The stuff go above and beyond, the rooms are really cute and clean, the swimming area that is immaculately maintained and they are kind enough to let you use bicycles which is a huge plus. There is also an extensive DVD collection, toys for kids to play with on the beach and beach chairs tomorrow. We had such a wonderful time. Thank you Vanessa , we appreciate your comments ! it was a real treat having you stay with us, say hello to your husband and sweet Olivia for us. We stayed in Apt #8 on the ground floor. It was a very comfortable apartment. We were very happy with Abbey del Sol - it's very nicely designed and kept up. The layout of the property offers many options for relaxing (a nice bonus during the hotter times of the day!) 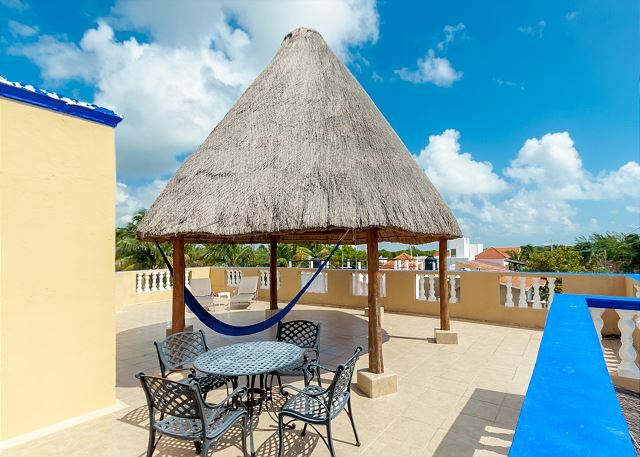 Each apt has it's own balcony/porch, the pool area is very pleasant, and there is a shaded palapa on the roof (where yoga classes are held in the high season). The staff is excellent and very accommodating. The owners are very nice. The one note I would have for Apt #8 is that it is the least private of the apts. Everyone has to walk by it to get to where they are going. Even so, there isn't constant traffic, and we still were able to have plenty of quiet time on our porch. The apt itself is very nice and comfortable. 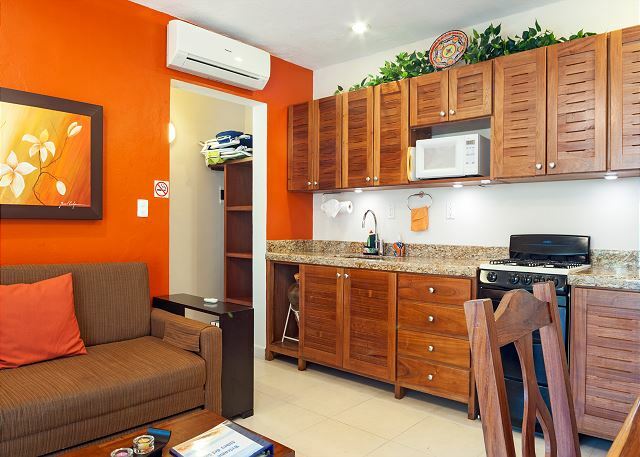 The property is toward the far end of town, but it's an easily walkable distance to the plaza of Puerto Morelos. There are also bikes available, and it's easy to take a taxi if you don't want to walk the 15 min to or from the plaza. We really enjoyed early morning walks to the plaza along the beach every day. 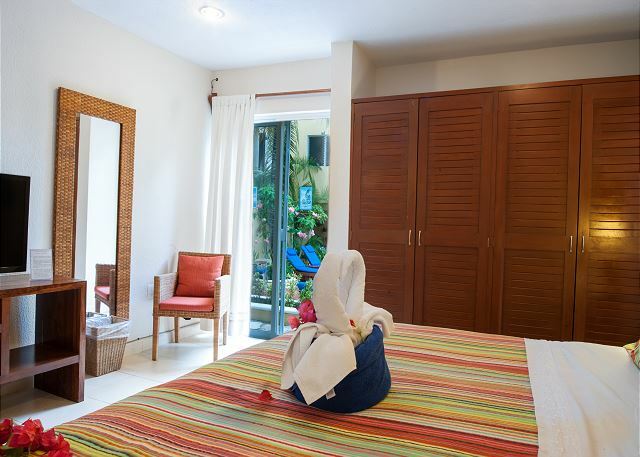 Abbey Del Sol is quiet, peaceful, convenient, and comfortable -- just what we were looking for! Hola Stefani and Mauricio, Thank you for taking the time to let us know how much you enjoyed your stay with us! We appreciate it and value your comments. Hope you'll come back and visit us next year. Wonderful place to stay and relax for a few days. Thank you Julie and Mike for your review! It was a pleasure having you stay with us, looking forward to your next visit. Everything was a promised. The condo is comfortable and well equipped. The grounds and pool are well maintained and there are many nice touches like a grill and rental bikes and movies. The office staff is fantastic, readily available nd ready to do whatever it takes to ensure your stay is perfect. 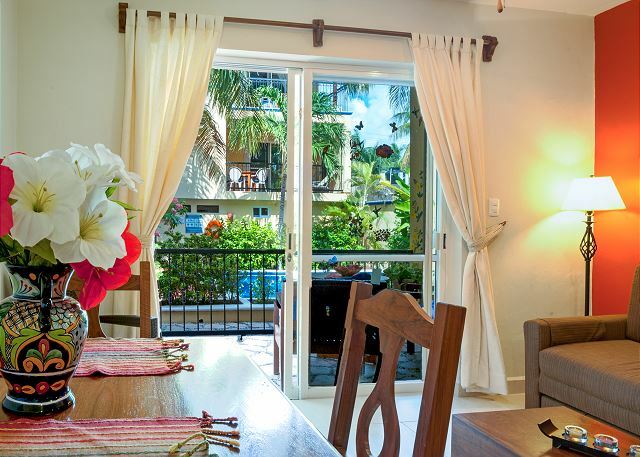 We were very pleasantly surprised to find this quiet, beautiful condo just two blocks from the beach. We enjoyed relaxing around the pool in the courtyard and time up on the roof. Everything was very clean and well kept and the staff bent over backwards to see to it that we enjoyed our stay. I can't think of a thing negative that would taint this pristine place. Honestly, I can't think of enough superlatives for the experience my family of 10 had spending the Christmas week at Abbey del Sol. The units are very spacious and well-appointed with everything you could possibly need in terms of keeping house for yourself. All in the best of taste: bright and cheerful and generous. The staff are amazingly kind and helpful. We couldn't have imagined how perfect this week would be! After our hurricane experience in Dominica, staying at Abbey del sol was a heavenly treat!! The place is fantastic, unpretentious and beautiful. We are a family of 4 with two small children (5 and 7). We cooked in the apartment during half of our stay, the staff was very friendly and accommodating. The free bikes available help us a lot getting food from the town centre (8-9 blocks away). The town is quiet and felt super safe, it is a bit isolated so I would recommend renting a car to go around and explore the Riviera or for grocery shopping in the "Colonia" (A five minutes ride, or $30 mexican pesos using a cab. Driving is quite safe. We spent three lovely days in Puerto Morelos at Abbey del Sol. Unit #8 was very comfortable and nicely decorated, and located right next to the pool. We only wish we could have stayed longer! From the first communication we had with the Abbey Del Sol team to the final journey to airport, our experience with Abbey Del Sol in Puerto Morelos, Q. was exceptional. The location is perfect for taking one of the curtesy bikes for a spin into town or hitting the beach with the curtesy beach chairs provided. The grounds are well kept, and the pool is maintained daily. The kitchen had everything needed for our 2 week stay. We took full advantage of the movie library. Marcela, Nancy, Gin, Milko, Yadira and the entire staff is very professional, kind, and caring. We hope to go back again soon. We highly recommend Abbey Del Sol. We enjoyed this small butique hotel it felt as if we had the place to ourselves. The other guess we're very friendly as were the hotel staff. The bikes that the hotel provides for use to go into town was very useful it made the trip into town easy. The only complaint would be that my wife and I had bed bug bites all over our legs we didn't notice anything on the bed. We first thought we had an alergic reaction to mosquito bites but we sprayed Off with deed so when we came home we went to see the doctor and they confirmed bed bug bits. We emailed the hotel to informed them of of what the doctors told us just so that they were aware. They mention that sand fleas are very active in the area so could have been the cause to our bites but we never went to the beach during our stay. Overall we really like the place and all that is offered to do in the surrounding area. We stayed in a large ground floor one bedroom apartment . This well equipped and spacious apartment had its own terrace overlooking the community pool but it was always quiet and peaceful as most guests went to the beach just a few steps away. The staff were always friendly and helpful, unobtrusive but very responsive to our needs. We enjoyed going to a different restaurant each night for dinner and the fifteen minute walk to the restaurant area downtown was always a pleasure. There are many places in town to buy healthy foods for home made breakfasts and lunches and a terrific cafe downtown to have that morning Java and watch the world go by. We always recommend this building to all ages of friends as there are good activities for the whole family in the town and general area. Owners pay attention to detail from their extremely user friendly and informative webpage to the design and decorating of the building and rooms to making sure the guests are well looked after. I arranged for my daughter, her husband and their two young boys to stay here. Their holiday schedule only allowed them 4 days in the Abbey, but they loved it! Very clean and well maintained. Everything looked freshly painted and the wall murals, plants and touches like the unique small fountain were lovely and artistic. Kitchen well equipped, though the family opted to try out many of the restaurants, especially for fish, tacos, pizza and steak! Staff and other guests were friendly, welcoming, and helpful. The beach is only a 2 or 3 minute walk away. The town square and the majority of the eating places and shops are perhaps a 10 minute walk, but free bikes are supplied for guest use, and inexpensive taxi service is available. A place with a cozy, homey, yet exotic feel! The hosts and their staff were wonderful and the apartment was lovely. Having Bikes and beach chairs at our disposal was very nice. You must try the fruit and vegetable market close to the center - very fresh fruits and vegetables. Great apartment and facilities. The Staff were friendly and professional. We stayed 14nights in 'low' season so the accommodation and town was quiet, this suited us. The pool was fantastic and our two year old loved it. Wholly recommended and we would go again. Our apartment was well equipped with everything we could need. My brother and his wife also stayed at Abbey del Sol - making our daily get together's easy! Pool side was lovely! Great staff! Easy walk to the beach. Nice walk to town for dinner. One night we cooked up a feast for 5 in our little kitchen - plenty of kitchen gear. 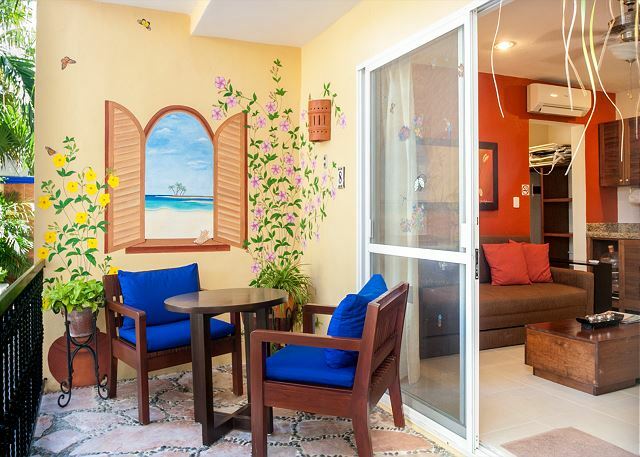 We were looking for an apartment in Puerto Morelos after spending 2 months in Oaxaca. It was abput 5:00 pm and very hot. There was avacancy sign on AbbydelSol and we stayed there for over a week. Clean, friendly close to bea h. Wonderful. Excellent location; great service; can't wait til next time! Arrangements were easy to make, transportation to & from the airport was looked after; the office staff were genuinely friendly, knowledgeable and accommodating, as were all involved with the complex and made you feel at home. Beautifully kept apartments and courtyard with access to a lovely pool and to bicycles free of charge, added to the great experience. 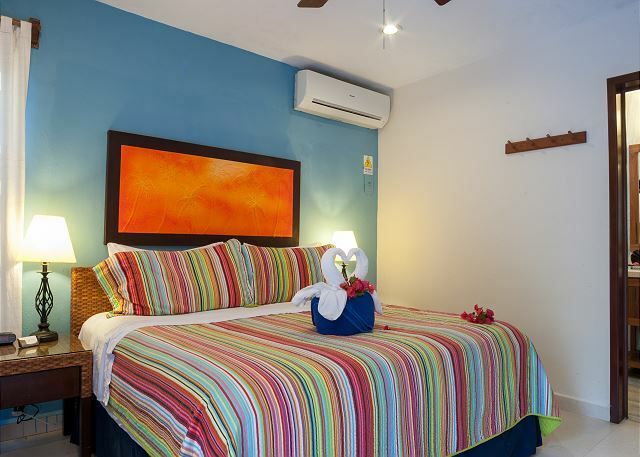 We were a short walk to the fabulous beaches and a healthy walk to the charming town of Puerto Morelos. What more could anyone want? staff was very friendly and helpful. Quiet location, roof top relaxing, short walk to beach, room # 8 on main floor clean, great for short stay. enjoyed free use of bikes to explore area and town. All restaurants offered great menus. Quiet town perfect for R & R. Will return. Note: some bikes would need to be replaced and would personally prefer kitchen countertop to be laminate instead of wood. Thank you for your hospitality and service. We enjoyed our stay at abbey del sol. The staff has been very helpful to make sure that our stay way wonderful. It is out second time staying there and we plan to come back again. The place is clean and charming. If there anything that needs to be fixed, they take care of it right away. We were very please with this place. From meeting my delayed flight arrival on time, to returning me safely, Abbey del sol was fabulous. I travelled, at 67 by myself and everyone welcomed me. Customer service is excellent. Any issue was dealt with immediately. Bikes are free.I think I ate at every restaurant in PM but my favorite was run by the same family that runs Abbey, el Saborit de Mexico. Only change, futon is ready to be updated or covered. 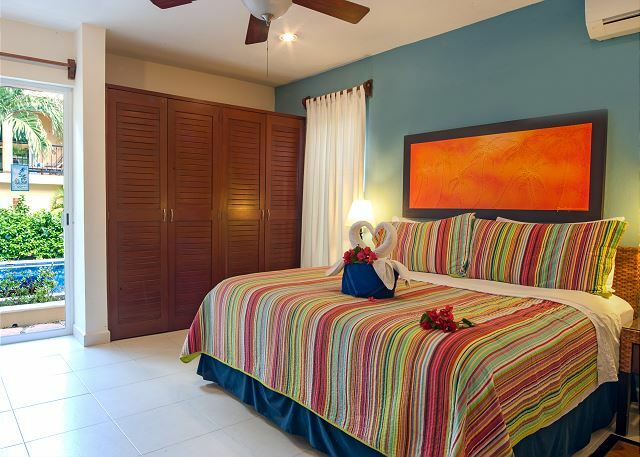 We enjoyed our stay at Abbey Del Sol Apt.8 The property was clean and comfortable. The staff went out of their way to be helpful and informative. I would definatly recommend this property to anyone looking for a relaxing holiday. Abbey del Sol always makes us feel so comfortable and at home. 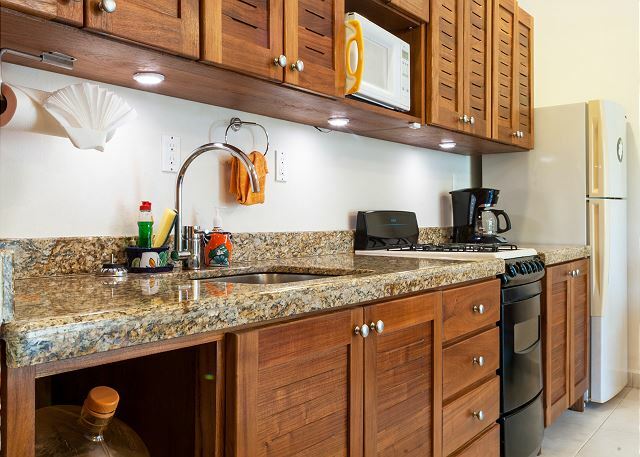 Almost everything is there to make your stay easier-all the way from the beach chairs and bikes, movies, available laundry, to the kitchen. Everyone there is very friendly and always helpful Love it! Great staff, clean apartment, lovely pool/garden area, good location. 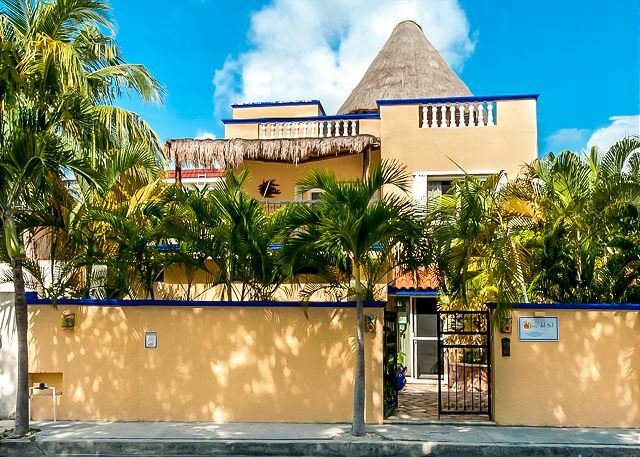 A top spot to rent in Puerto Morelos. 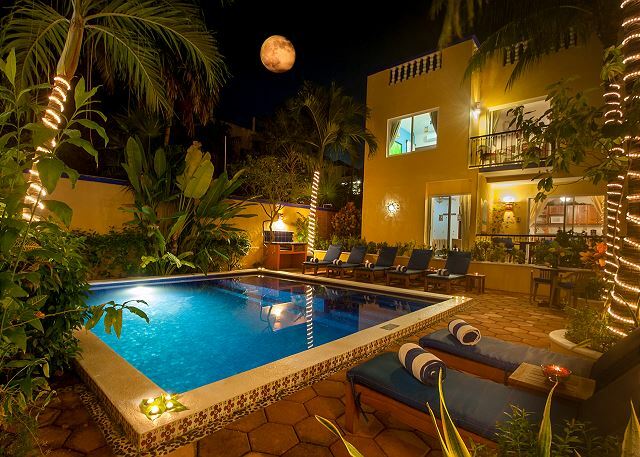 Had a wonderful time, the premises were beautiful, well kept, very comfortable, very nice pool, the apartment was complete with everything you could need. the location was perfect, 1 block from the beach, the manager was very nice and helpful with our needs. Loved it!! Within the first 20 mins of arriving, Puerto Morales felt like a special treasure......we were thinking of spending time and then heading onward to explore other nearby towns, but a "sweet and welcoming" vibe took over and we wanted to spend our short visit here. Finding Abbey del Sol by a new friend we met chatting at the Cafe in town, we instantly feel in love with it. Beautifully manicured and inviting in a quaint small beach town of Mexico, the grounds were spotless, the personnel were gracious and the room - Spectacular! A Little apt fully equipped with everything you could need, even cute bags for your laundry or taking your towels and etc to the beach. Wish we could have stayed a week! Would have loved to have enjoyed a bicycle ride around the town, as they supply them. And relaxed with a bottle of wine in our room and watch a first rate DVD (a fabulous library provided). Just to catch a cool breeze sitting by the pool and listen to the birds......Yep. We look forward to our return!! Thank You Abbey del Sol! 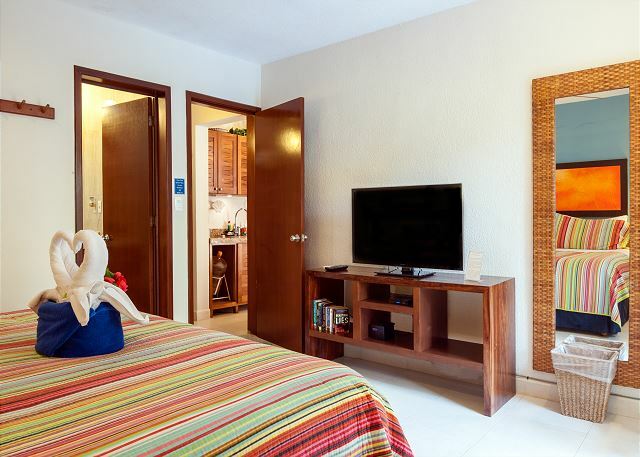 Abbey del Sol provided all the conveniences we needed and wanted during our 13 day stay in Puerto Morelos. The staff was welcoming and knowledgable about excursions in the area. We appreciated the peacefulness of Abbey del Sol. The pool area was comfortable, a perfect spot to lounge and read. Can't say enough about the responsiveness of staff to our questions and needs. Our bed was comfortable. Availability of DVDs was a nice addition. Our one minor criticism would be that our unit (#8) could stand a bit of spiffing up. We visited other units, and found that they were much more spacious and attractive. Unit 8 was the only one available when we made reservations. In a perfect world, we would have preferred a different unit. Nonetheless, our stay was very enjoyable and we will return. We had a great stay; Great location ; warm and friendly staff; Am pleased to recommend to all who are looking for a great location for a Puerto Morelos stay. The staff are great! Beautiful rooms. Very close to the beach but, a bit of a walk to the shops and town center. 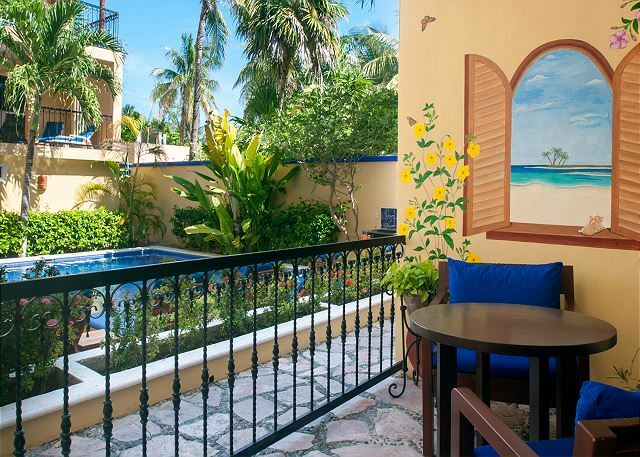 We love Puerto Morelos and Abbey del Sol. This is out 3rd stay. Perfect small town ambience, best beach on the Mayan Riveria. Abbey and Tiff are the perfect host. The property was very pretty. Management was very good about booking tours and rides to airport. A little far from town but close to beach and nice surrounding area. Although we were only staying one night, our unit was perfect for us. The staff , Pilar and Jin, are so welcoming. The grounds are beautifully kept, and the bed was very comfortable. Love this place! Let me start by saying I had originally booked 12 days in Cancun at another property. The other property was very dissapointing and after 5 days I simply walked away without being able to get a refund. A Mexican man in Cancun told me about Puerto Morelos and described the area as "tranquilo" and I could understand enough spanish to know that is what I wanted. I quickly got on the internet and after looking at 5 or 6 places I found the Abby Del Sol II. I made all the arrangments that day over the internet and arrived the next day. I was so relieved the moment we arrived and walked through the gate and heard the gurgling water fountain and lush vegitaion. Then we met Pilar, she runs the office and is a wonderful woman with a bright smile and perfect english. Pilar made us feel welcome from the moment we arrived until the moment her staff took us to the airport on the last day. The Abby is quiet, comfortable, reasonable and as described which is VERY important to me. Only a block or so from the beach which makes it nice and quiet. Its about a 10 minutes to walk to the town square for shopping and food. In all a great place for a romantic get away or for a family event. I hope you will enjoy as much as I did. Very nice and tranquil place. Will definitely go back there. Great find in Puerto Morelos! This was my 7th year in Puerto Morelos and was thrilled to find such a gem! Very private, lovely property with extremely helpful staff. This place suited our needs very well. It was a bit too far for my mother to walk to town most of the time. On the other hand, taking taxis was very easy. The pool was really nice (a bit cold in february). The rooms were really nice and clean. The dvd library has a good selection. People were helpful. We had booked another place but were disappointed with the noise. We stopped in Abbey del Sol to ask about rooms. They were very helpful. They had a room available for the remainder of our stay. They helped us move our luggage and allowed a late check out as our room was not needed for an extra day. It was a really good experience. The condo has everything you need for a relaxing stay in a quaint village. Staff was very helpful in every aspect of meeting our needs. We will be back!! Our second visit to Puerto Morelos and Abbey Del Sol was equally nice, comfortable, and relaxing. The owners and particularly the managers do everything possible to ensure your needs are met. Tours of the Colonias for alternative shopping possibilites as well as assistance with recreational opportunities are a plus. The small, friendly town of Puerto Morelos is perfect--a step back to the Mexico beach vacations we first fell in love with 30 years ago. 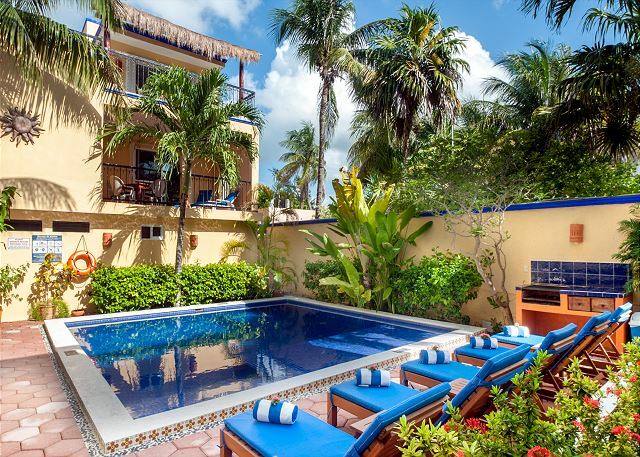 We wanted to visit the small town of Puerto Morelos, and booked a room at Abbey del Sol based on the recommendation of a local real estate agent. We loved the town, the little restaurants, and the hotel. It was a very comfortable and convenient place to stay. It was quiet, clean, and charming, with a friendly and helpful staff. We look forward to staying there again!